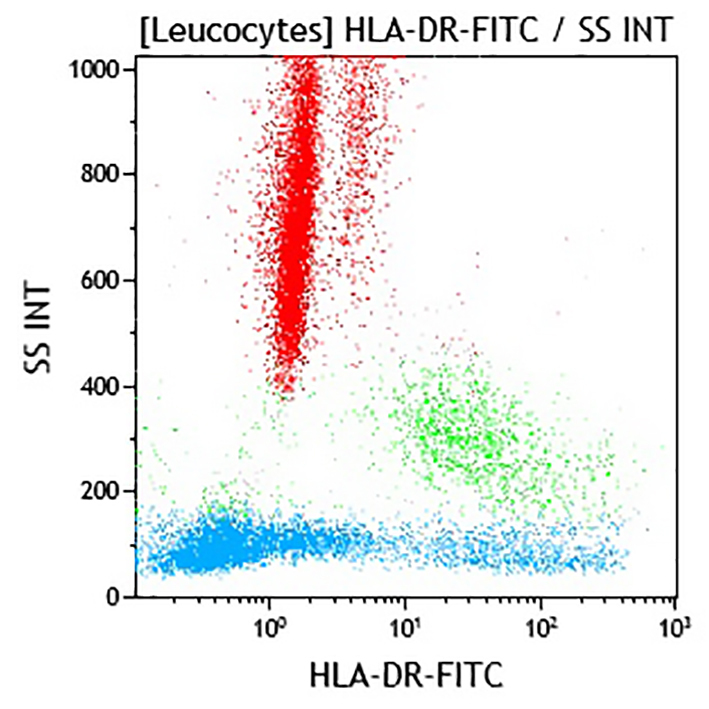 The human major histocompatibility complex (MHC), also called human leucocyte antigens (HLA), is composed of three groups of molecules designated MHC class I, class II and class III. The MHC class II genomic region, or HLA-D region, contains the genes encoding HLA-DR, -DQ and -DP antigens. The MHC class II molecules are built by the non-covalent association of α/β heterodimers. Both heavy (α) and light (β) chains span the cell membrane. They have molecular weights of 31-33 kDa and 26-29 kDa respectively. HLA-DR molecules are found on antigen-presenting cells (APC), i.e. dendritic cells, B lymphocytes, monocytes, macrophages, Langerhans cells and thymic epithelial cells. They are also expressed on activated T cells, but not on granulocytes, platelets, or red blood cells. Resting T cells or endothelial cells that do not normally express these molecules can be induced to express them. HLA-DR is also expressed on some hematopoietic progenitor cells at different stages of differentiation.